Another day, another selloff. The broad market is correcting deeply for a second straight trading session, with the big S&P 500 gapping down to re-test the lows set in October -- during the worst month for stocks since 2011. Even worse, this drop in stocks has been led by the very same stocks that have been the momentum leaders for the last two years. Up until the last several weeks, big tech plays like Apple (AAPL - Get Report) , Amazon (AMZN - Get Report) , Netflix (NFLX - Get Report) and Alphabet (GOOG - Get Report) (GOOGL - Get Report) were exactly the kind of names investors wanted to get exposure to when the going got rough. And while the market selloff understandably has investors rattled here, there's one simple question that market participants should be asking themselves in this market: What's actually still working here? The answer can tell you a lot about what you should be doing with your portfolio right now. For starters, it's a very good sign that the answer isn't "nothing" right now. Some stocks are actually managing to continue to look attractive from a technical standpoint in this environment. And they happen to be "the usual suspects" when markets turn volatile and investors go "risk off". To figure out which stocks are holding up here - and how to trade them - we're turning to the charts for a technical look. J&J is the prototypical blue chip, and that makes it a classic defensive play. During Monday's trading session, Johnson & Johnson managed to keep its head above water in spite of the selling, an indication that it became a "flight to quality" trade, attracting investor dollars as they rotated out of tech. Tuesday shares are managing to hold up much better than the broad market. Johnson & Johnson has been in a well-defined uptrend since the end of the summer, culminating in a breakout at the start of this month that's pointed shares higher in recent sessions. The 50-day moving average has done a good job of acting like a proxy for support in this stock. 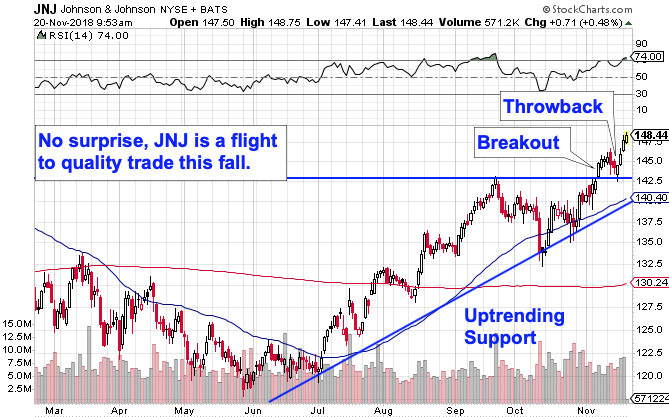 That makes it a solid line-in-the-sand to watch here; as long as JNJ remains above that line, the uptrend remains intact. 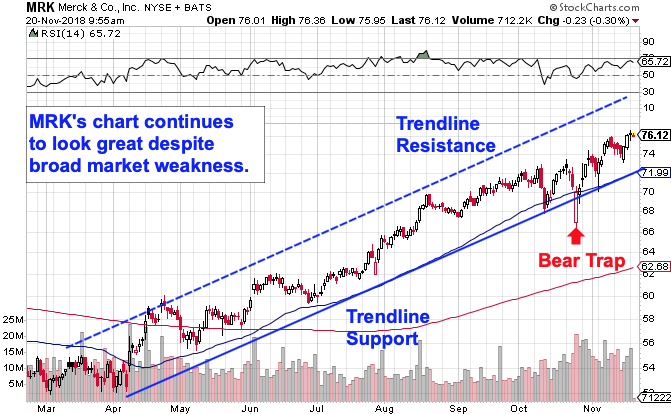 We're seeing similarly strong price action from another big healthcare name: Merck & Co. (MRK - Get Report) . You don't need to be a trading expert to figure out the price action in Merck's chart - with the exception of a short-lived bear trade at the height of October's volatility, this stock has done a stellar job of holding a very well-defined uptrend this fall. Like with J&J, Merck's uptrend is being defined by the 50-day moving average; as long as shares continue to hold above that level, this remains a strong defensive play worth owning in the final stretch of 2018. XLU has been forming an ascending triangle pattern for the last couple of months now, and shares are teetering on the edge of a breakout through the $55.25 level that's acted like a ceiling this fall. A material breakout through that $55.25 level signals that buyers are definitively in control of things in the utility sector, something that can't be said for most corners of the market right now. 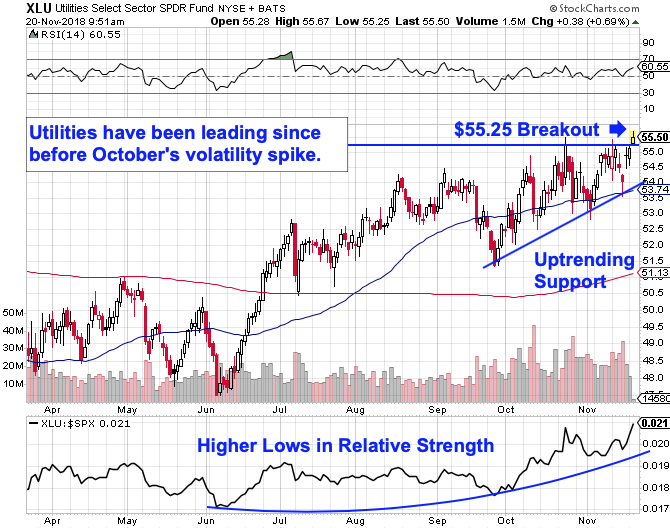 It makes sense to keep a close eye on the utility sector as a pocket of strength as investors cope with uncertain times.